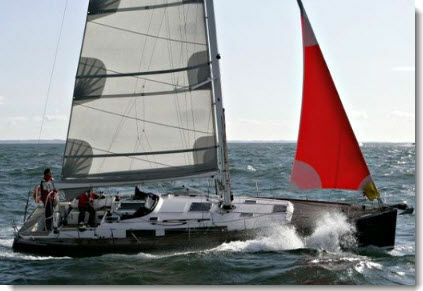 Discover the “Wrap-Around” Storm Jib! “Today, Norwegian sailor Jon Amtrup, cruising expert and publisher of TheSailNews shows you a new innovative product that allows you to hoist a storm jib faster and easier and from the safety of the cockpit! There is no really easy way to hoist a storm sail when the weather is bad. The key is to be prepared. And the new Storm-bag looks like a product that can make life on foredeck and on board much easier in a big blow. 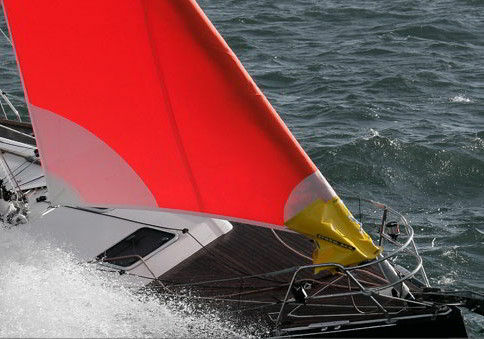 The Storm-bag is a new concept from the company Storm-bag Delta voiles in the French sailing Mecca Trinité sur mer. They have seen the way modern cruisers are set up with one furling Genoa and very seldom any cutter stay. What to do when there is a big blow coming? The shape of a nearly rolled up Genoa is very seldom a good solution. And to take the Genoa down on deck may seem like a nightmare for people who are only taking it down every autumn. There already exists a few different solutions for rigging a storm jib, but most of them require a lot of work on the foredeck in heavy conditions. The Storm-bag is so far the smoothest solution we have seen. Hoisted from a small bag, the storm jib wraps around the existing furling unit. Sheets are already attached and lead aft to the cockpit, ready for instant control.